We departed Cedar Breaks National Monument around 3:30pm on Tuesday, September 13 for the hour and a half drive back to Zion National Park. 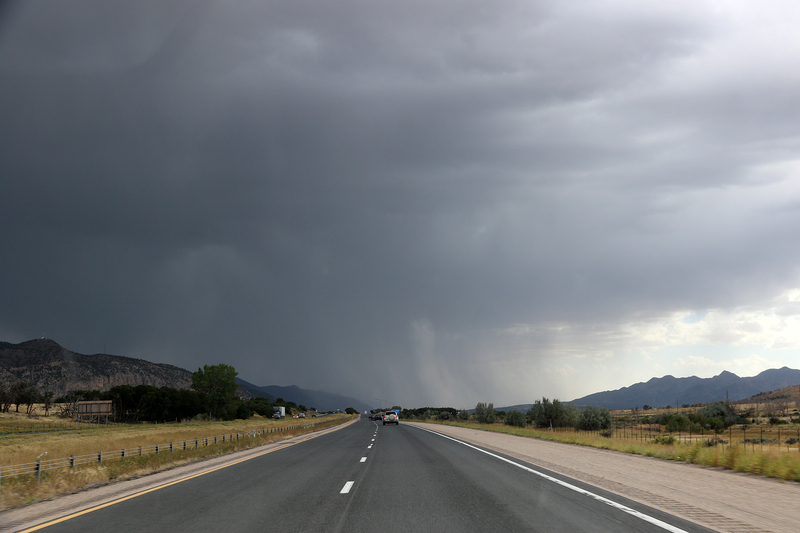 As we traveled south on I-15, an immense thunderstorm system blew east to west across the interstate. Thunder, lightening, winds strong enough to knock over a semi, and torrents of rain caused us to slow to a near standstill. There was even some flash flooding. It was a genuinely frightening driving experience. But finally we passed out of the storm and continued on our way under relatively dry conditions. We stopped for gas in La Verkin, Utah. To the north, the skies were still black and thundery. It was likely not a good moment to be in the Virgin River Narrows or other slot canyons in Zion. 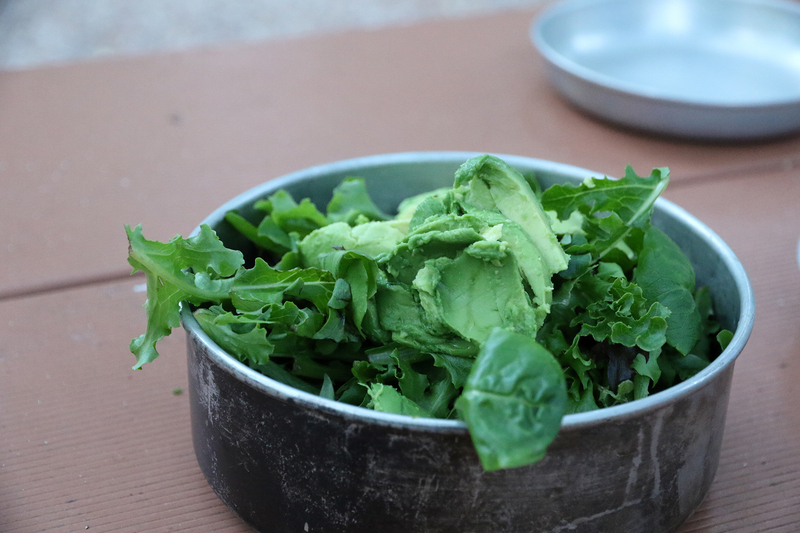 Afterward, we went to a market in La Verkin and got some fresh greens, avocado, asparagus, and steaks to have for dinner. We arrived back at our campsite at about 6. 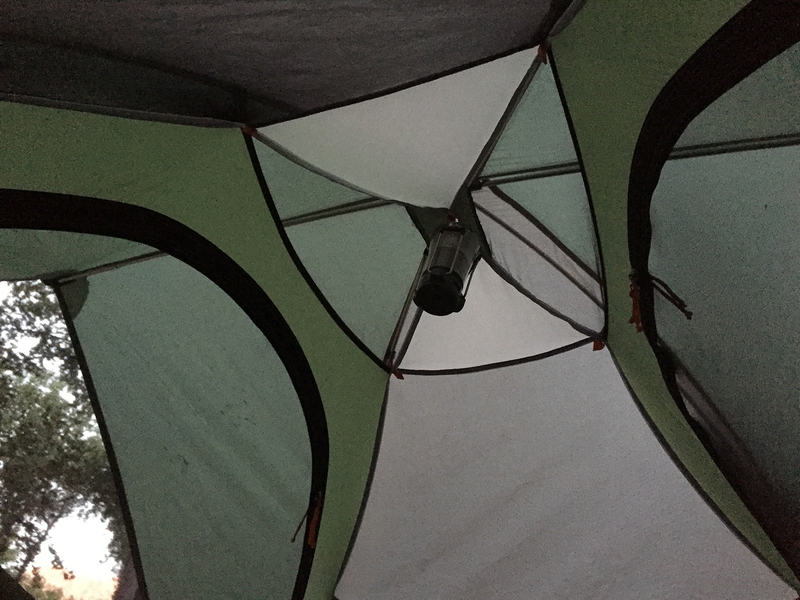 Our tent had blown over, but otherwise there was little evidence of the storm. 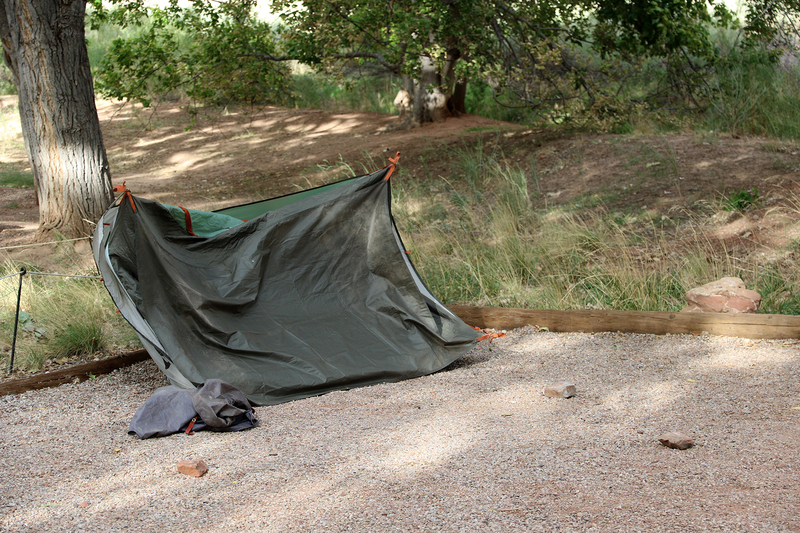 We righted the tent and started our evening’s campfire. 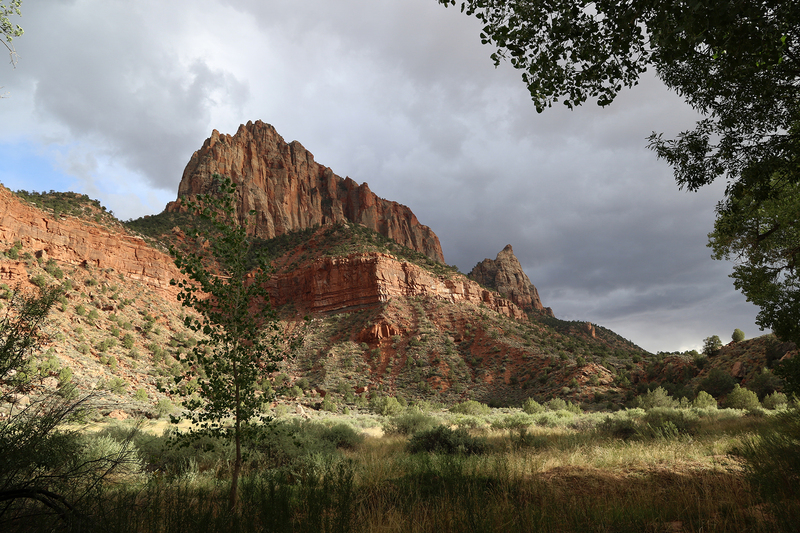 We relaxed in camp with some boxed wine while we watched the clouds clear above the Watchman. Our neighbors in the campsite to the north of ours were from Australia. 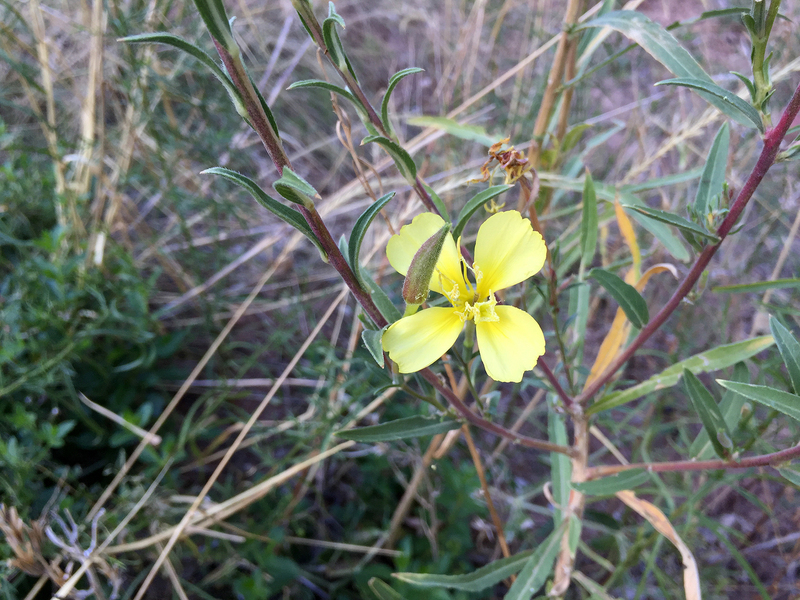 The wife had been born and raised in Minnesota, but they were raising their son in Australia, which accounted for the accent that Sean and I had been wondering about. The little boy was delighted by squirrels and chipmunks, which they did not have at home. He had a little chipmunk puppet that he carried everywhere while they were in the campground. 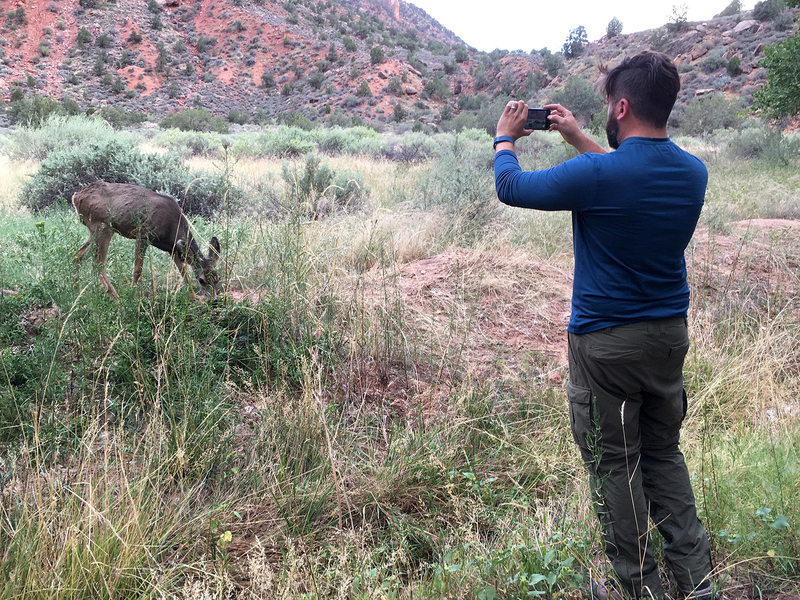 After meeting our human neighbors, we met our ungulate neighbors in the form of a female Mule Deer and her twins who were gracious enough to stand picturesquely for photos in front of the Watchman. Such civility! The deer were utterly unconcerned with our presence, much like the Whitetail Deer had been at Shenandoah National Park back in July. The mother and one of the twins were quite calm and focused on having their evening meal. The other twin was rambunctious and appeared to be running and jumping and bouncing around for nothing more than the sheer fun of it. 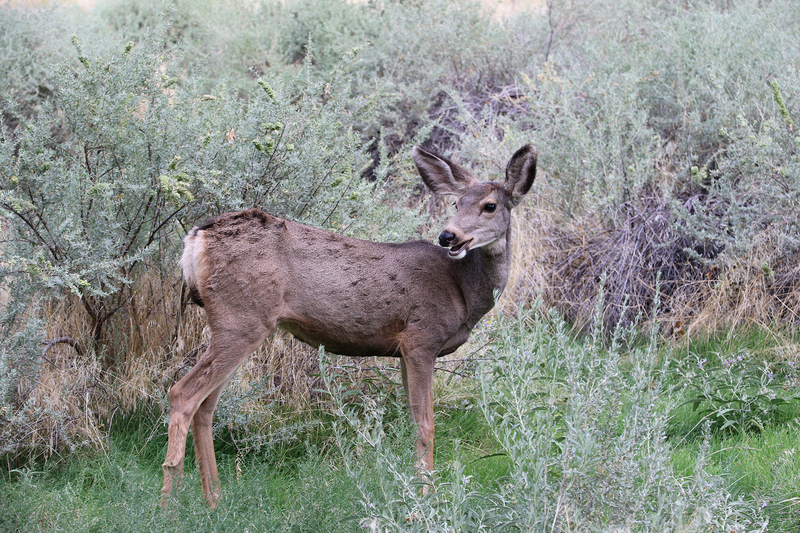 This was a deer that apparently delighted simply in being alive. 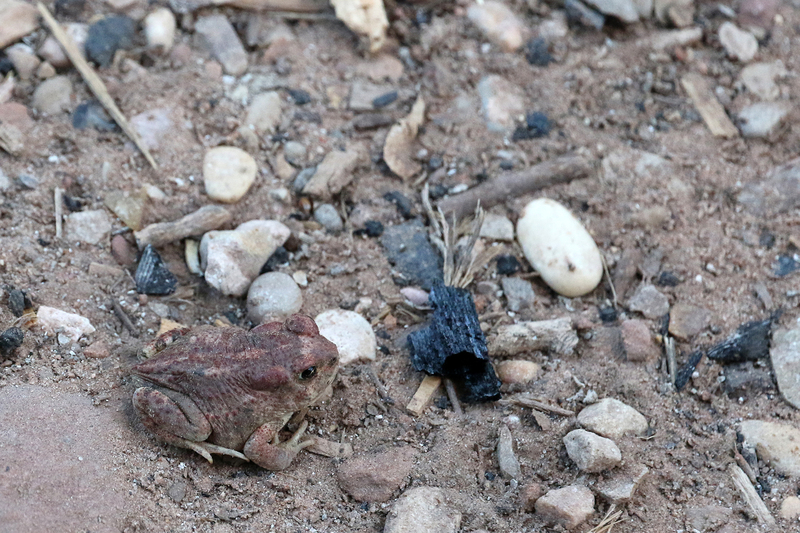 After the deer passed by, we spotted a little Red-Spotted Toad near the campfire ring. 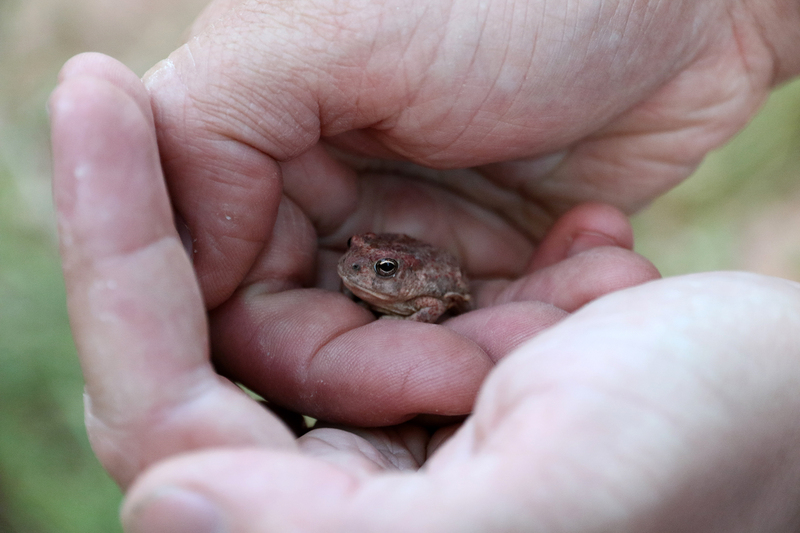 In fact, the little toad kept insisting on trying to get into the campfire ring. 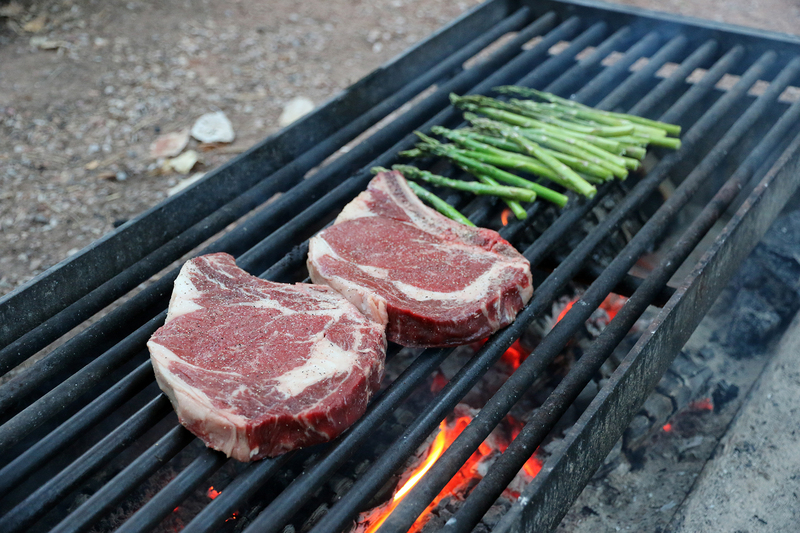 In order that it not get cooked up along with our steaks, I gently picked it up and placed it outside our campsite. 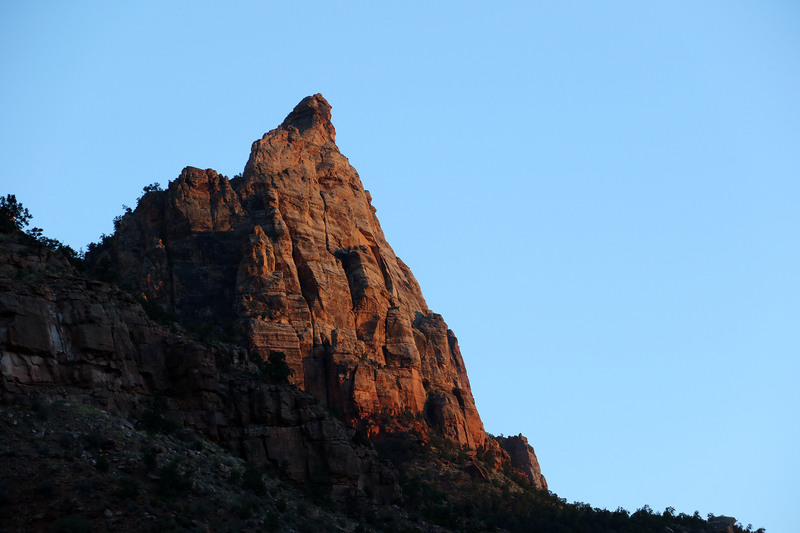 By 7:30, the clouds had completely departed, giving us our evening’s blaze of sunset on the Watchman. 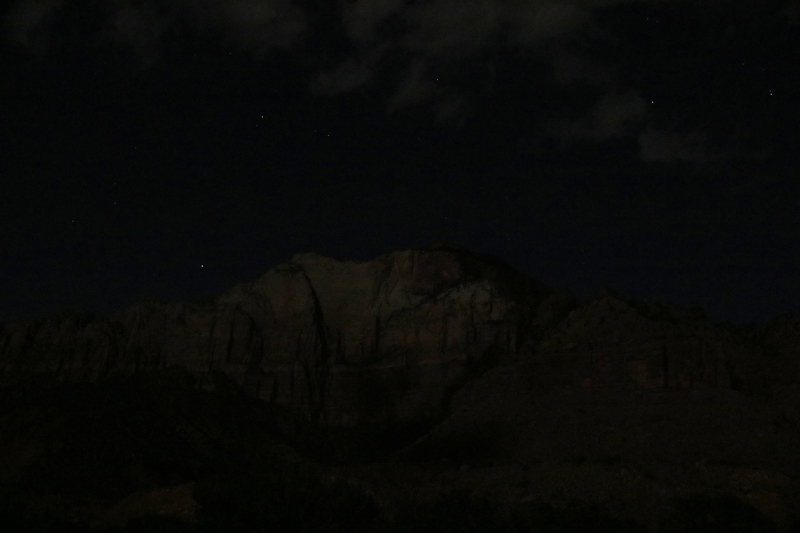 We grilled up our steaks and asparagus and had a hearty campground supper as twilight deepened. After we ate, we quickly washed the dishes before walking over to the campground amphitheater. 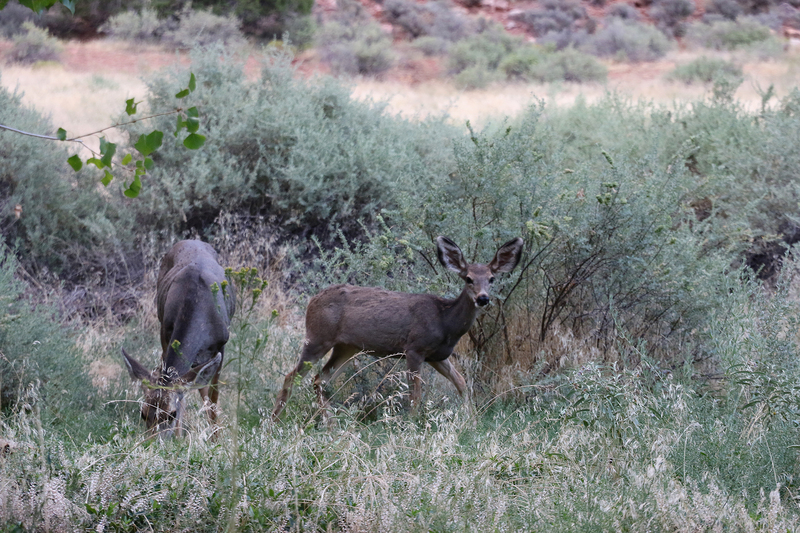 The evening’s ranger talk was on arches in Zion National Park. Ranger Mike presented and explained the difference between arches (a span without running water beneath it) and bridges (a span with running water beneath it). He explained the the Great Arch of Zion was a blind arch because it was not yet a free-standing span. 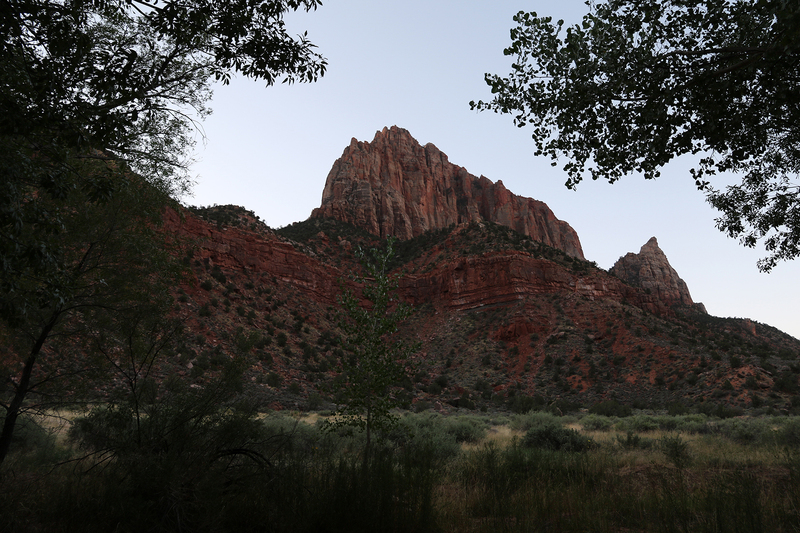 He spoke of, and showed in photos, the many hidden arches of Zion. 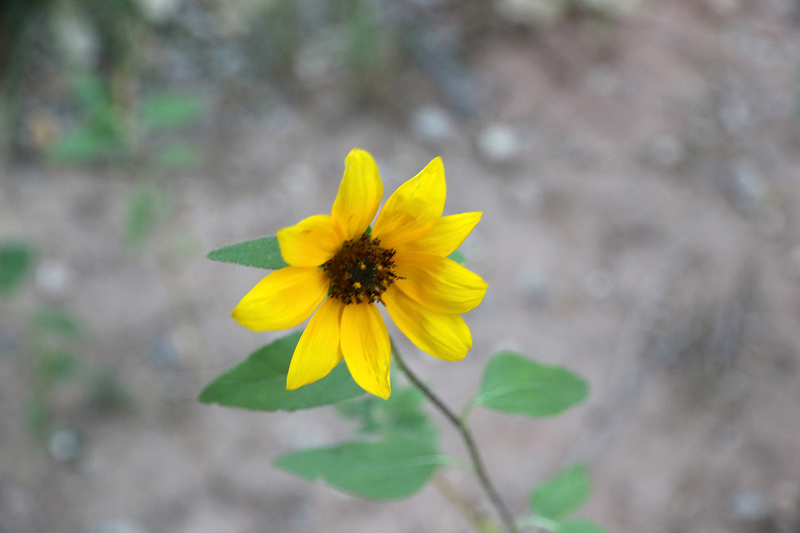 Most of these were high up on the walls of the canyon and were camouflaged or invisible from the canyon floor. 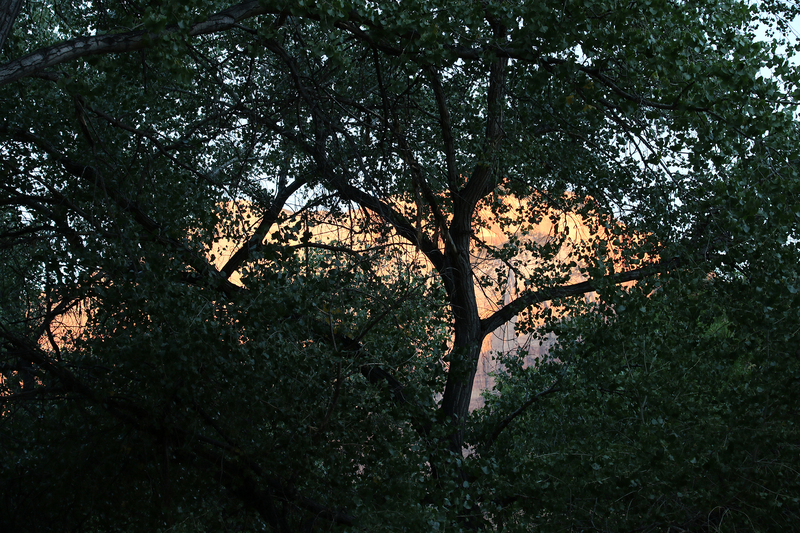 Throughout the rest of our time in Zion, we would be spotting and identifying blind arches, arches, and natural bridges. It was a great example of learning in the classroom of the National Parks. 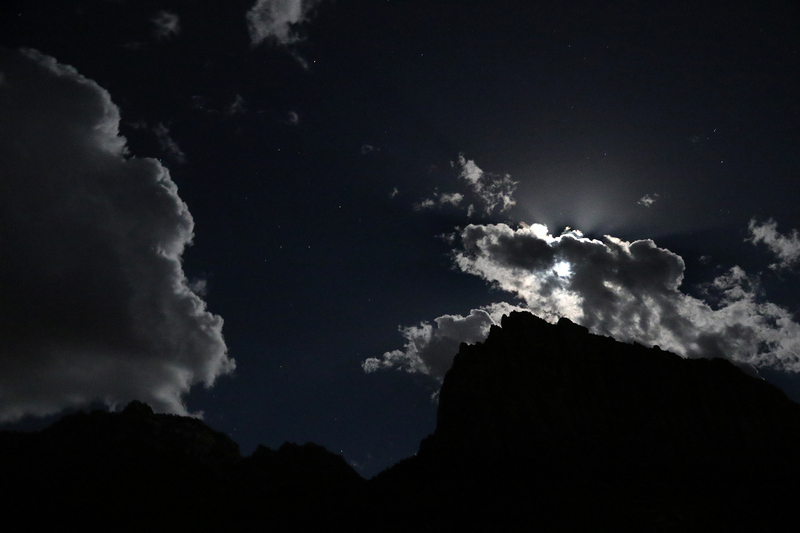 On our way back to our campsite, while crossing a dark stretch of the campground, we were struck by the beauty of the moon and clouds against the silhouette of the canyon’s formations. While we gazed at that, and at the stars and planets becoming more and more visible, we realized we weren’t alone. 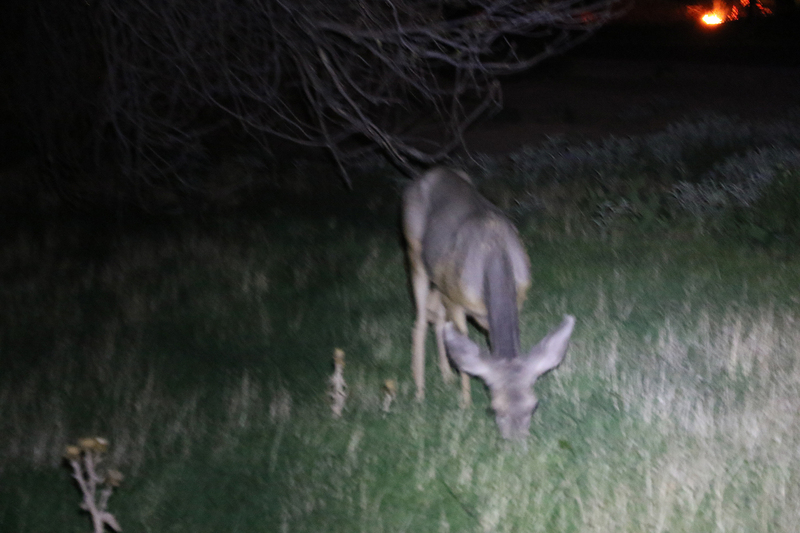 Our deer family had wandered down and were browsing quite close to us in the darkness. Back behind us, the West Temple glowed in the moonlight. 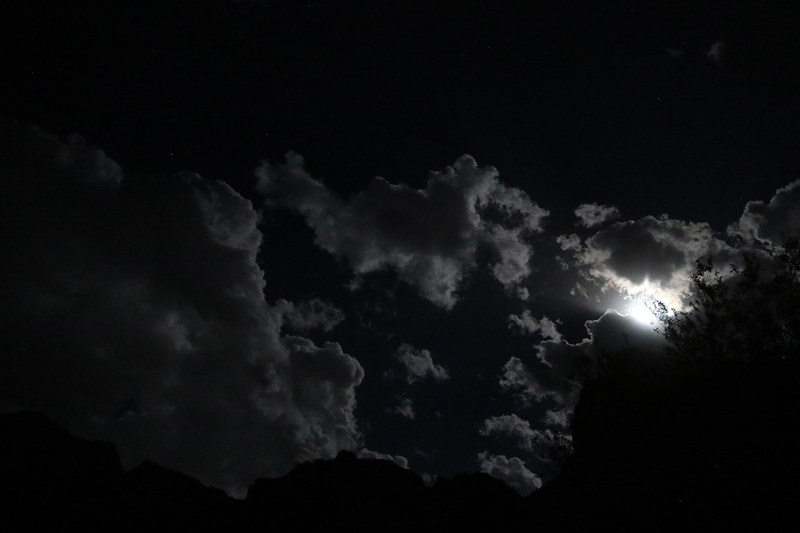 The entire nighttime effect in Watchman Campground was magical. 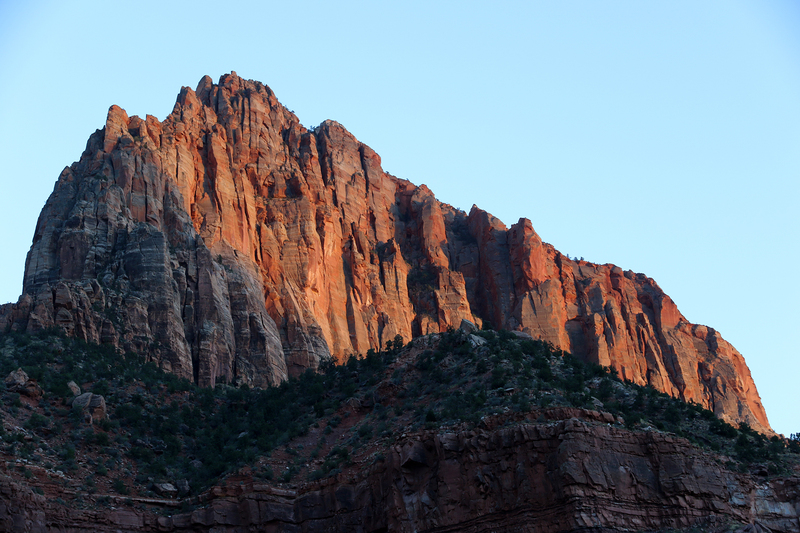 We were falling hard for Zion National Park without really having seen much of it. 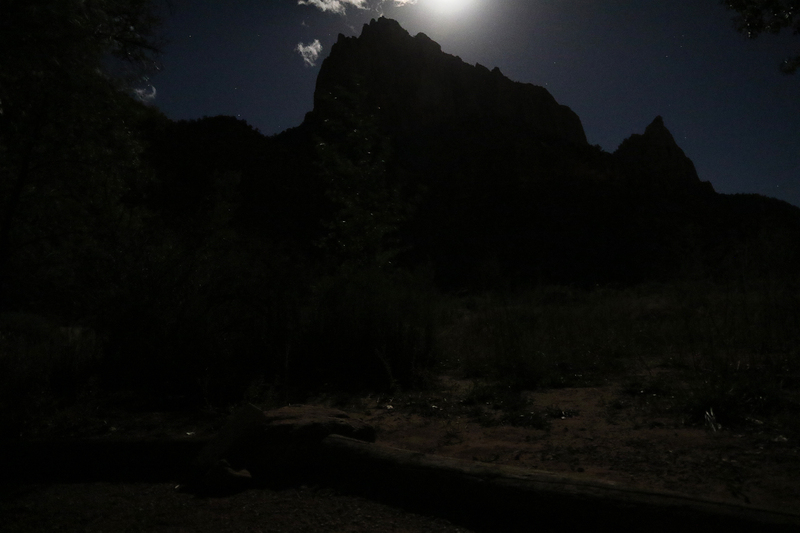 Back in camp, we lingered late by the campfire, gazing out at the Watchman and at the moon. It was bright enough to read by merely the moonlight. The logs that formed the border (of both our campsite and the entire campground) between us and the literal wilderness beyond glowed with the invitation to step easily between the two worlds. Next morning dawned absolutely cloudless, and our old friend the Watchman was there to bid us good morning. 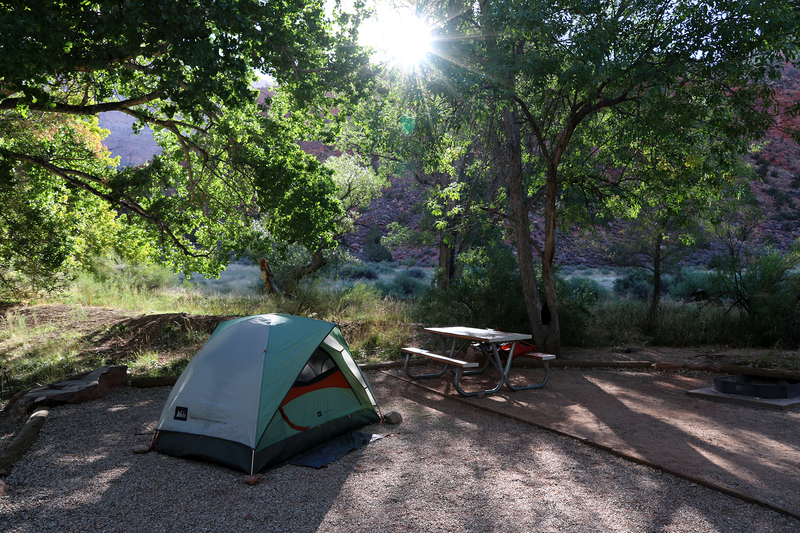 We had our breakfast and prepped our packs for a full day of adventure in the heart of Zion Canyon. 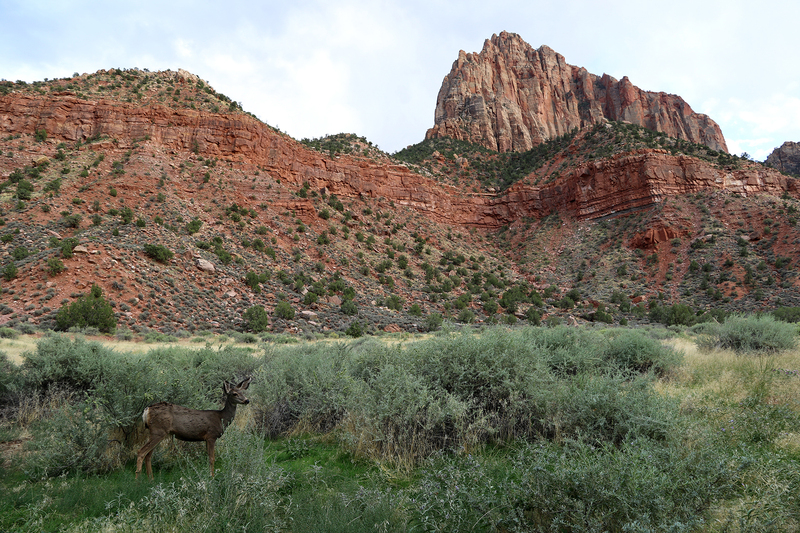 This entry was posted in Journey and tagged Camping, Grand Staircase, Utah, Zion on June 23, 2017 by Brandon Hayes.